The October 2009 agreements signed between Russia and China, characterize the transformation of all of Asia taking place today, and they reflect the economic tradition and principles developed by U.S. Secretary of Treasury Alexander Hamilton and others. These developments have been described by Lyndon LaRouche as an important historic step towards realizing the “Four Power Alliance” among China, Russia, India, and the United States. In addressing a webcast January 30th 2010, LaRouche emphasized, that only through such a Four Power Alliance, with adjoining countries, and where the United States is an indispensable partner, would there be enough power to eliminate all monetary systems, and to establish a global system of a fixed-exchange-rate credit system. Such a credit system would form the basis of a global agreement on high-technology development of the entire planet, through long-term credit agreements among these nations, to rebuild the world as a whole. 1. 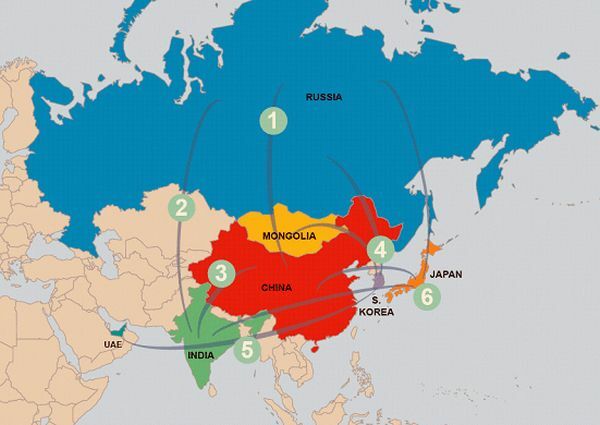 Russia-China: On Oct. 13, 2009, Russia　and China signed a broad package of economic development agreements, using China’s extensive dollar reserves for vast infrastructure development projects across the Russian Far East, Russian nuclear power projects in China, and related economic cooperation. Lyndon LaRouche described these agreements as marking a shift in the dynamics of world history, toward Pacific-centered global development, and a significant step toward the establishment of a Four-Power Agreement among Russia, China, India, and the United States, as defined by LaRouche as the necessary power alignment required for establishing a new world credit system. 2. India-Russia: Indian Prime Minister Manmohan Singh’s visit to Moscow in December concretized the process of re-establishing strong economic relations between the two nations, which had seriously declined since the end of the Cold War. 3. China-India: The breakthrough agreement between China and India, to jointly reject any imperial dictates at the Copenhagen Climate Conference in December, succeeded in subverting Britain’s intention to use the global warming hoax to undermine the sovereign development of nation-states. Despite serious tensions between the world’s two most populous nations, since the 1962 India-China border war, both sides now recognize there is “no option” other than cooperation and engagement. 4. South Korea-Russia-Mongolia: South Korean President Lee Myung-bak’s government has moved rapidly to become a de facto partner in the emerging Four-Power alliance, especially through its relations with Russia; Korea is now emerging as a leading technology resource for the region and the world. Lee’s visit to Moscow in September 2008 resulted in agreements on: completing the “Eurasian Rail Land-Bridge” from Amsterdam to Busan, by finishing construction of the Trans-Korean Railway through North Korea, connecting South Korea to the Trans-Siberian Railroad; construction of a gas pipeline from Russia to South Korea, also through North Korea; and for South Korea’s involvement in infrastructure development across the Russian Far East. While the bottleneck caused by the North Korea imbroglio has stalled some aspects of these development plans, Seoul is building a port on the Russian coast on the Sea of Japan, in part, to facilitate trade with Russia, and provide access to the Trans-Siberian Railway, bypassing North Korea, for now. In the long run, Lee envisions joining South Korean technology with North Korean labor, in projects on the “new frontier” of the Russian Far East, using joint economic cooperation to facilitate peaceful reunification of the Korean peninsula. South Korea is also preparing for massive investments in Mongolia, involving Korean responsibility for an undeveloped, under-populated area, larger than the landmass of South Korea itself. Initial investments will focus on natural resource development, due to the lack of manpower, but the mission is to develop new cities, power facilities, and industrial, agricultural, and transportation infrastructure. 5. South Korea-U.A.E. : South Korea, this month, became a nuclear power exporter for the first time, winning a $20 billion contract to build four 1,400MW nuclear reactors in the United Arab Emirates. Knowledge Economy Minister Choi Kyung-hwan, who was in the U.A.E. for the signing of the construction deal with President Lee, said, in a news conference, that Seoul will outline a master plan to build atomic power generation into one of the country’s leading export industries, along with autos, ships, and information technology. There is already a pressing need for nuclear power across Asia, as throughout the world, and a severe shortage of production capacities to meet that need. As traditional Asian nuclear power producers, Russia, Japan, and India, strain their own capacities, and as the U.S. and other Western powers have allowed their nuclear production capacities to dissipate, Korea’s emergence as an exporter is crucial for solving the global energy crisis. 6. Japan-Russia/India/China: Japan, with the world’s second-largest economy, is not likely to take a leading role in establishing the Four-Power January 8, 2010 EIR Feature 21 Agreement, but, as LaRouche has emphasized, both Japan and Korea will almost certainly join and play a crucial role in the new Pacific-centered global economy once the Four-Power alliance is established. Prime Minister Yukio Hatoyama, together with parliamentarian Ichiro Ozawa, considered by many to be the real power in the newly elected Democratic Party government, has reached out to China, Japan, and India through direct diplomacy and economic cooperation. After Hatoyama made China his first overseas visit as Prime Minister, Ozawa then headed a 600-strong delegation to China in December, including 143 parliamentarians from his Democratic Party and hundreds of business leaders. Ozawa described the “future Sino-Japanese relationship” as a crucial “21st-Century partnership in human history.” At the same time, Chinese Vice President Xi Jinping, expected to be the next Chinese President and Communist Party leader, visited Japan, and was granted an audience with the Emperor on short notice. Chinese Defense Minister Liang Guanglie also visited Tokyo, signing an agreement on unprecedented military cooperation. While prioritizing China relations, Japan has also taken steps to strengthen ties with Russia and India. Foreign Minister Katsuya Okada met Russian Foreign Minister Sergei Lavrov in Moscow in December, wherethe two discussed the importance Russia places on developing its Far East and Eastern Siberia, noting that　both Presidents Dmitri Medvedev and Hatoyama hope to solve the territorial disputes left over from WorldWar II, in order to get down to the important task of cooperating to develop Eurasia. Prime Minister Hatoyama also visited India in December, consolidating the rapidly rising investment and trade between the two nations. The summit between Hatoyama and Prime Minister Manmohan Singh specifically focused on infrastructural developments, particularly the proposed dedicated rail freight corridor between New Delhi and Mumbai, and Japan’s offer to share high-speed train technology with India.